Our Load Zone impact bars are newly redesigned after more than a year of research and testing. The result is an impact bar that is 241% stronger than our previous bar. UHMW is bonded to high performance Kryptane® urethane, creating a single piece construction and eliminating open bolt holes as found on other bars. 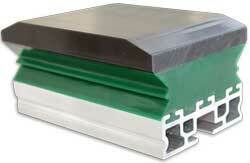 These layers are supported by an engineered insert that provides 241% more strength. Our bars accept a standard 1/2″ (12mm) grade 8 bolt and washer instead of a costly T-bolt, reducing hardware costs. Multiple formulations are available, including MSHA-approved flame retardant formulas.